Eloisa James’s New Release THREE WEEKS WITH LADY X is out NOW! and it’s a New York Times and USA Today Bestseller! ELOISA is currently running an amazing contest! 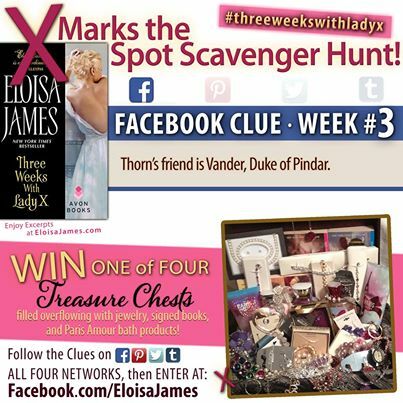 You can win 1 of 4 treasure chests filled with jewelry!!! (scroll down for details). The one thing Thorn can’t afford to lose–his fierce and lawless heart. CONTEST: Reminder — WEEK 3 of X Marks the Spot Scavenger Hunt! I’ve dropped clues all over the internet (FB, Twitter, Tumblr & Pinterest) if you find them all, come back here to enter. You could win 1 of 4 treasure chests filled with jewelry! All the details are on the “X Marks the Spot” app here on my fb page. Look for the large pink X for all of the contest details. ELOISA JAMES bio: A reviewer from USA Today wrote that she “found herself devouring [Eloisa’s] book like a dieter with a Hershey bar”; People Magazine raved that “romance writing does not get much better than this.” Eloisa wrote her first novel after graduating from Harvard, but alas, it was rejected by every possible publisher. After she got a couple more degrees and a job as a Shakespeare professor, she tried again, with much greater success. Over twenty best-sellers later, she teaches Shakespeare in the English Department at Fordham University in New York City. She’s also the mother of two children and, in a particularly delicious irony for a romance writer, is married to a genuine Italian knight.